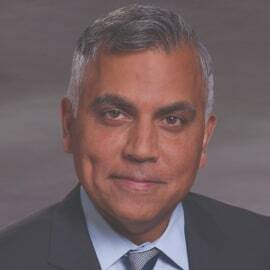 Raj Batra is President of the Digital Factory (DF) Division for Siemens USA. In this role, Batra is responsible for overseeing all development, marketing, sales, R&D, vertical industry and manufacturing aspects for DF in the United States. Joining Siemens in 1993, Batra has held a variety of high-level management, strategy and sales positions including VP, General Manager, Global Corporate Account Executive, and Director and founding member of the Automotive and Aerospace Vertical Market organizations. In addition to his responsibilities at Siemens, Batra serves on the Executive Advisory Boards of The National Electrical Manufacturers Association (NEMA) and the Manufacturers Alliance for Productivity and Innovation (MAPI). He is also a Member of the Board of Directors of PI-North America. He recently joined the Board of Director for MKS Instruments, Inc. (NASDAQ: MKSI), a global provider of technologies that enable advanced processes and improve productivity for companies in the semiconductor, industrial technologies, life and health sciences and research and defense markets. Prior to Siemens, Batra worked as a sales engineer developing automation solutions for discrete manufacturing and process industries. Batra earned a Bachelor of Science in Electrical Engineering from Lawrence Technological University in Michigan and a Master of Business Administration (MBA) from the University of Michigan.